Different Types of Bridal Shower Gift Baskets! Yes, you can buy Bridal Shower Gift Baskets but it really is quite easy to make your own! There are many benefits to homemade bridal shower gift baskets - not only are they easily affordable but they are also unique. So be creative and personalize a unique bridal shower gift - perfect for a bride-to-be! This section provides ideas for creating gift baskets at home! Gift Baskets can be made from boxes! The traditional wicker gift basket is popular and comes in a variety of colors and styles. But do remember that it isn't essential for gifts to be packed into a wicker basket! You can use different types of boxes or bags as containers for the gifts! This gives you total flexibility over size and decoration! You can also use a gift as a container! Basket, Bag and Box coverings and decorations can be used to compliment your Bridal Shower theme! For a Kitchen Themed shower you could even fill a colander with gifts! Wondering what to give to the host of the party to say Thank You? This is a perfect solution! Include some little treats and personalize the basket by including a nice framed photo taken at the party - a lovely keepsake for a kind and generous person. The Mother of the bride-to-be deserves a basket with presents specifically designed for her! Fill it with candy, fruit, note cards, stamps and toiletries. Include some nail varnish and make-up. Small items especially for her! Adopt the same principle and create a lovely basket full of surprise presents for the proud parents of the happy couple. Party Hosting Hints, Tips and Ideas for baskets! 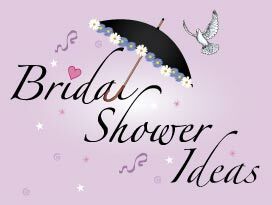 Our selection of Shower Ideas includes our unique printable Bridal shower invitations. Top ideas for Bridal Shower Gift Baskets! Fully personalized and homemade Bridal shower invites and thank you cards are not only easy to make and print with the addition of photos but are also cheap to make!